I was always a huge reader. I had allergies, specifically an allergy to smog, that kept me indoors a lot – books were my escape. Writing was a natural offshoot of that quality that defined my childhood. It’s a dream come true that I’m able to write for a living. Defining moment? There were many. I received a lot of attention from my grade school teacher, Mrs. Bucholtz, for an essay I did about being a test tube baby. In middle school, I had a notoriously mean, snarky English teacher who nevertheless gave me “As” on my essay writing – I received a “D” in the class because I didn’t hand in one assignment. Then, when I learned how much television writer/producers were making! Childhood favorite: So many, but Charlie and The Chocolate Factory takes the prize. I must have read Roald Dahl’s classic a dozen times as a child. I think I identified with Charlie way too much – I really believed that I deserved to find that gold foil flashing inside a candy barwrapper. After all, I was a really good kid. As an adult – again, I’ve read so many good novels. My favorite novelists include Philip Roth and Cormac McCarthy. I’d have to say “No Country For Old Men”. So spare and evocative. His description of one of the scariest (yet realistic) killer in modern literature sends chills up my spine. Best piece of advice from another author: Indirectly, from Steven King, who in his very helpful book, “On Writing”, said to write 1,000 words a day. In your book; Seven Deadlies: A Cautionary Tale, can you tell my Book Nerd community a little about it? Seven Deadlies is about a bright, observant scholarship student Perry Gonzalez, who finds herself tutoring high school kids who embody the Seven Deadly Sins. It’s my warped version of a Grimm’s fairy tale. For those who are unfamiliar with Perry, how would you introduce her? Voice and style. This is a tough one. And there’s probably a lot of people out there who have better advice than I. I would say this: Write how you speak. And become a very good listener, so you can write how others speak. Also – know the rules of grammar, the rules of writing – know them enough to throw them away if they don’t fit the emotion of what you’re writing. And never quit. If you really want it – and this doesn’t mean you want to talk about wanting it – then you are obligated to sit and write. For a long time. Even though people may hate what you write or, worse, hate you for writing. Write. What did you list after at Perry's age? What do you lust after now? I lust after peace. I guess my needs have changed a bit. Readers can stalk me on Twitter @gigilevangie, Instagram @gigilevangie, Facebook at Gigi Levangie Grazer, or any coffee shop or yoga studio on the Westside of Los Angeles. 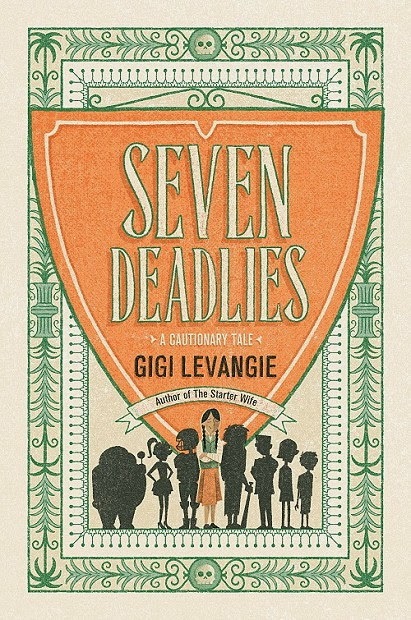 New York Times bestselling author Gigi Levangie Grazer returns with Seven Deadlies, a witty and wildly different novel set amid the sinful reaches of Beverly Hills, narrated by a captivating, gimlet-eyed Mexican-American heroine. Gigi Levangie Grazer’s uncommon storytelling approach in Seven Deadlies: A Cautionary Tale, tells the peculiar life of a teenage latina set in the culpable parts of Beverly Hills. Living with her mom and a scholarship student, Perry Gonzalez makes extra money by tutoring her classmates. Smart but poorer than her classmates, she’s an aspiring writer whose set her goals to attend the exclusionary Bennington School to supplement her education. Her experiences with the students she tutors becomes the platform in which she analyzes life and life’s seven deadly sins. The stories that Perry cleverly observed provided an interesting, yet unusual insight of life. Each story is filled with her own unique observation and administers a meticulous ending. She uses these stories as a way to form a better understanding of life and most importantly, herself. It also extends to her mother Yelena, which helps strengthen their relationship. Readers will appreciate the point of view of this very young teenager. At fourteen years old, it’s almost expected that she is full of agony and uneasiness. However, Grazer firmly stays away from this and delivers a goal-oriented teenager. I thought this approach added more depth to the story. The way Perry has examined the seven deadly sins through her peers, and how she uses these observations to apply it towards her own life was absolutely fascinating. The expectations that are developed at first are quickly diminished as the story progresses. Grazer amazingly delivers a story that is totally unexpected. There’s plenty of wit and cleverness that will keep readers at full attention. The cultivation of all the stories not only gives Perry a sense of who she is, but it provided a real-life scenario of struggles of a single-parent family. Thank you Gigi for making this giveaway possible. 1 Winner will receive a Copy of Seven Deadlies: A Cautionary Tale by Gigi Levangie Grazer.